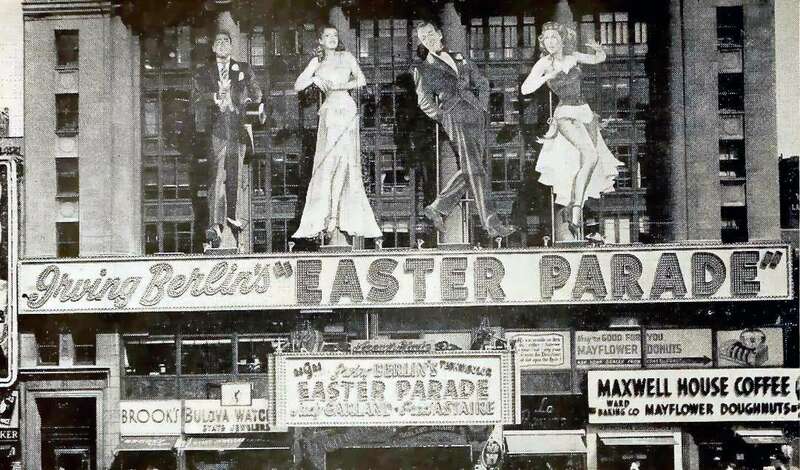 “Largest theatrical display on Broadway made its début last week when MGM’s Easter Parade opened at Loew’s State as the first feature in the theatre’s new long-run policy. “The facsimiles (and reasonably accurate, too) of the four top stars in the picture (l-r: Peter Lawford, Judy Garland, Fred Astaire and Ann Miller) are three and one-half stories high (you’d have to climb a ladder to tie Astaire’s shoestring). Ray “Crash” Corrigan once again dons the gorilla suit to play White Ponga, the name of the albino ape throughout the film. An industry joke back in the 1940s was that PRC stood for Pretty Rotten Crap and not Producers Releasing Corporation, a poverty row studio turning out a film in a week or two on an extremely low-budget. 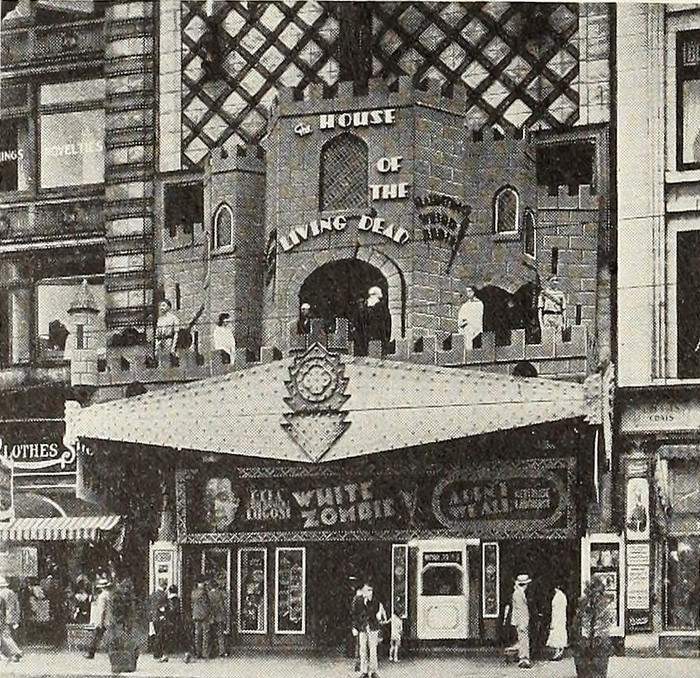 “Take a good look at the grand front Thomas [Cleary] engineered for ‘White Zombie,’ and if you all don’t agree it’s a cuckoo then our eyes have gone back on us. Cost a bit, to be sure, but when results are taken into consideration, it’s nothing to get cold feet about. “Lest the photo does not reproduce to full advantage, a false turret-like top portion of a castle was built about the marquee, flooded at night time with a bank of blue lights that produced a weird effect. The seven ‘Zombie’ characters standing at different points on the marquee were ‘live’ and caused a lot of comment from passers-by below on the street. 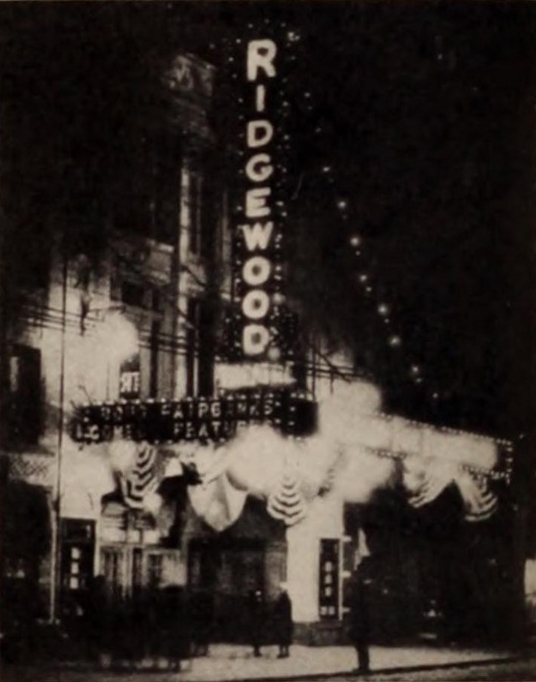 “If you’re going to put on a midnight horror show, reasoned Manager George Peters of Loew’s Theatre, Richmond, Va., then go out and ballyhoo it. And he did. “He obtained five new Studebaker convertibles and paraded them around the downtown section the afternoon before the show. The first was driven by a blindfolded driver, the second contained the Monster and the others were filled with beautiful girls. Needless to say, the show was a sellout. 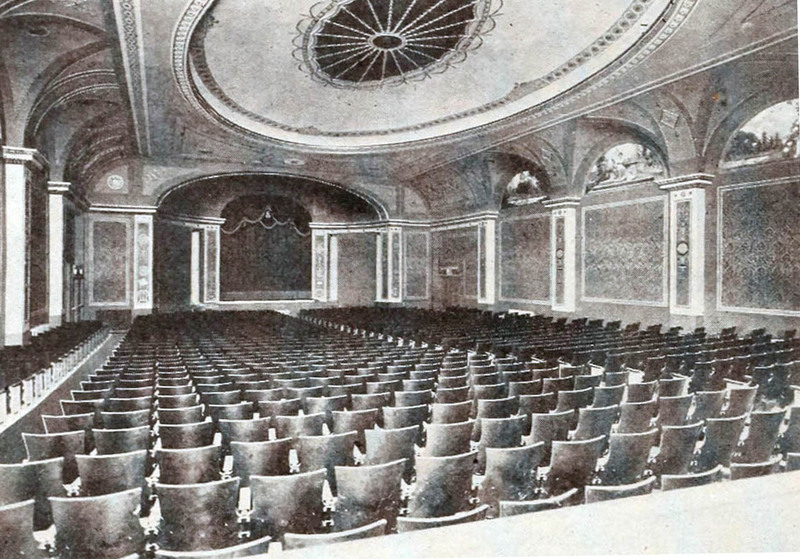 “One of the latest additions to an already large list of motion picture theatres in Brooklyn is the new State theatre at DeKalb and Franklin avenues built by Bleendes & Strausberg. “There are fifteen hundred seats and each seat has an unobstructed view of the screen. The matter of cooling and ventilation received close attention, the contract for this part of the equipment being placed with the Typhoon Fan Company of New York. “On each side of the screen special compartments were constructed and the large Typhoons installed, the air being forced out into the auditorium through grilles just over the screen. Cezar Del Valle is the author of the Brooklyn Theatre Index, chosen 2010 Best Book of the year by theTheatre Historical Society. “The dominant advertising thought among Brooklyn exhibitors is for the advertising of the theatre primarily, the attraction being given second place in the majority of cases. “S. 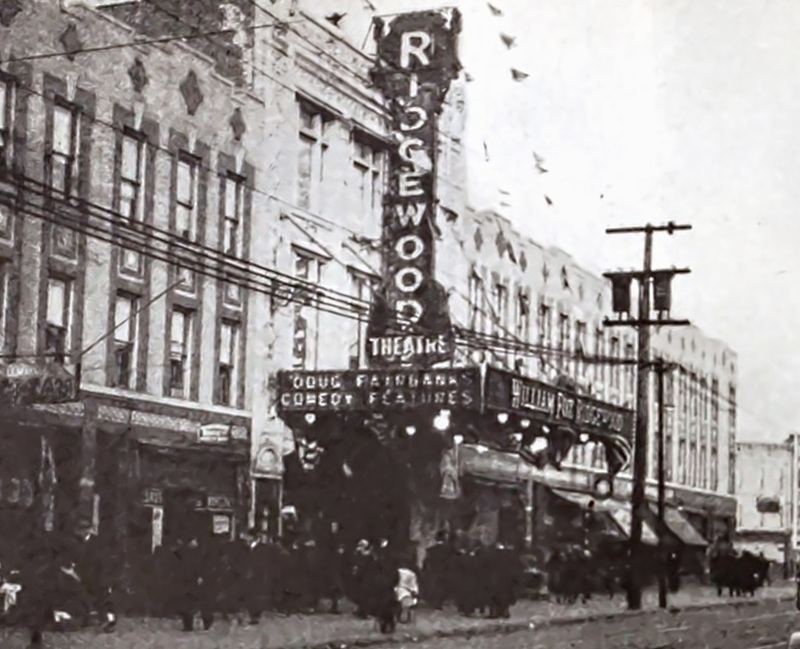 L. Whiting, manager of the Ridgewood theatre, shown in accompanying illustrations, gave evidence of this tendency in his 4th Anniversary Week, in progress at the time the photograph was taken. “Though ‘The Mark of Zorro,’ Douglas Fairbanks’ most recent United Artist production, was the attraction, the theatre and the anniversary were brought most prominently into the foreground in practically all publicity efforts made. “The policy is thoroughly commendable in almost every respect. There lies in the adoption of such a policy a single danger, the possibility that an attraction of unusual merit may be given less than its due amount of advertising and the engagement therefore yield less than its potential profit, but that danger is one which should not give pause to the man who realizes as every man should realize that it is by his theatre rather than by attractions exhibited therein that he must succeed or fail. “The possibility is easily avoided by an extension of budget limitations to accommodate extra advertising for the theatre itself rather than pay for it out of the general advertising budget. “K.C. 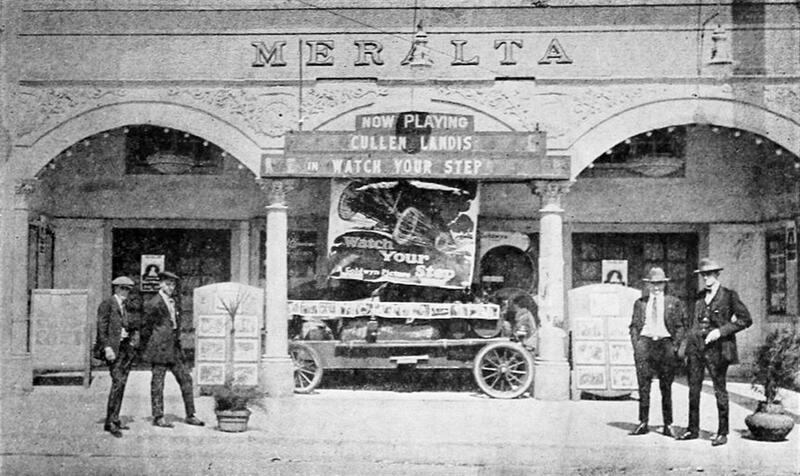 Manny, manager of the Meralta Theatre, a Los Angeles suburban house, put Goldwyn’s Watch Your Step over by means of two unique exploitation stunts at very little costs. and lettered the sidewalks within a radius of half a dozen blocks of the theatre, in addition to stencilling the title on the automobile. Three-sheets, one-sheets and color enlargements, obtained from the exchange, added color to the lobby display.